Finally a Fish Eye lens for my iPhone that I can actually use! Watch out… the tunnel walk ways, bridges, old buildings and dense forests will never been the same. At lease, not the same through the eye of my iPhone camera. 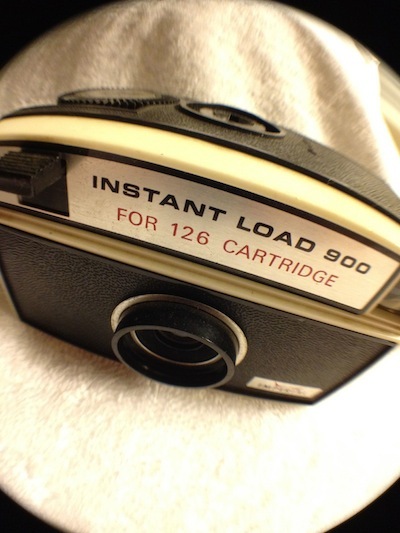 I have gone through fish eye options both software and physical hardware. There is some acceptable software available and that is what I have had to be using. The problem with the Fish Eye lenses I have tested on my iPhone (yes, I bought all of them, ugh!) has presented me with a variety of issues. Mostly the problem is because I have a thin vinyl protective skin on the back of my iPhone . It protects the iPhone glass face and it has a fun design I did that makes my iPhone mine in a crowd of millions of iPhones. The hardware played with so far has included lenses that attached via a small magnetic ring that stuck to the iPhone… which covered up the flash all of the time. There was the full case version that would have been ‘okish’ if the lens could be removed from the case, instead it was full case on/off. One of my favorite is the Olloclip… very nicely made with three lens options to use… issue being is that it is a precision fit around a bare iPhone with too close of tolerances to allow a fit over the back skin. I actually made a template to use for cutting out the corner of the iPhone skin just so I could use the Olloclip, I’ll post that up shortly for you to use if you have the same challenge. 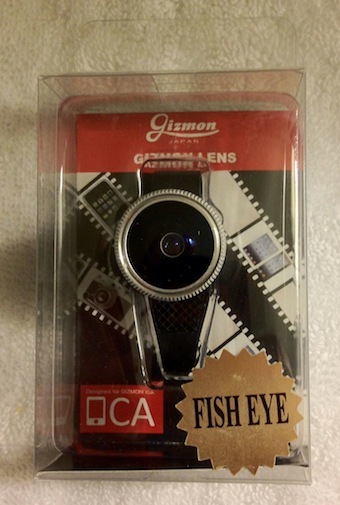 Enter, the Gizmon Clip-On Fish Eye. Simple design, why didn’t I think of it?!! The folks at the Four Corner Store Web site offer three versions. The Fish Eye, I’m covering here… The Polarizer, which I will review after I play enough to know it for a review, and the 3 Image Mirage… not my sort of thing. Each of the Gizmon Clip-On lenses come individually packaged. The lenses are attached to the clip so you will be carrying as many full units as you need with you, not just a clip and lenses. 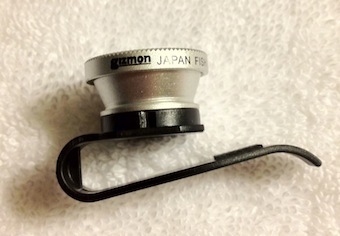 That is fine, the lens/clip is reasonably small enough to toss into any bag. The clip slides easily over the iPhone edge, judging by the extra area in the loop, it should work over the edge of most tighter fitting cases. The pressure ‘finger’ of the clip does rest on the iPhone’s screen but since it is plastic, it doesn’t confuse the screen thinking it’s a finger. The design means that it will work on my iPhone 4s, along with my iPad and my friend’s older iPhone 3Gs too. The lens is easy on/off. I found that for best alignment of the lens over the camera, rather than looking through the iPhone screen, I flip the iPhone over and look through the lens to encircle the camera. The larger outside diameter of the lens is working well for clearer images than I experienced with other options. I’ll do a head:head between this and the Olloclip and report back. Meanwhile, pretty happy with my purchase for easy of use.